Early on in this collection of the bizarre, the strange and the impossible, we are introduced to a character called Sir Henry Mandifer, a man who, having made pots of money as a writer, had ‘taken to spiritualism’ and was at the top of his game. On his way to investigate another intriguing piece of paranormalia, he congratulates himself that this particular call had come from a straight-laced, prim and proper old school friend who, in the normal course of things, wouldn’t stand for such nonsense. ‘It only showed you,’ Sir Henry ruminates, ‘that the tidiest lives have nothing but quicksand for a base. 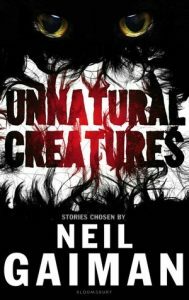 The snuggest haven’s full of trapdoors and sliding panels, unsuspected attics and suddenly discovered rooms.’ No wonder Neil Gaiman chose to open his selection of stories with this particular one. I suspect Sir Henry is a man after his own heart – possibly with wielding a stake to shove through it. With multiple awards, bestsellers and a bibliography as long as your arm, Neil Gaiman is something of a cult figure. There’s a reason why on the cover of this particular book, his name is about two-hundred times larger than the words ‘stories chosen by’. It’s not actually by Neil Gaiman, see, but the publishers clearly hope that by the time you’ve realised that, you’d have opened it, and been seduced by the deliciously baroque typography – each story is prefaced by a black page, designed like an invitation to the funeral of someone terribly posh – and are already reaching for your wallet. And the book is, definitely, worth buying. The title page beckons you like a moustachioed impresario into his freakshow: ‘The Museum of Unnatural History Presents… a number of unnatural creatures along with several other creatures who are either unlikely, impossible, or do not exist at all.’ It’s a great ploy: a kind of ‘enter if you dare’ threat that pulls the reader in. Sixteen stories, a mix of previously published and new, by sixteen writers, some long-dead (E. Nesbit, Saki, Frank R. Stockton, Anthony Boucher), some very much alive (the youngest, E. Lily Yu, a mere twenty-three years old), with a fairly decent gender ratio (9:7 to the boys). Taken together the whole thing is reminiscent of the display cases of exotic or marvellous curios: the precursors of the modern museum. Open up this particular cabinet and you’ll encounter mermaids and wolf-men, hamadryads, phoenixes, unicorns – not to mention (because you can’t: it’s unspellable) the nameless blob of the first story. Gaiman clearly had a lot of fun putting this anthology together. He’s a big fan of James Thurber’s The 13 Clocks (1950), which he says ‘may be the best book in the world’, and selected a story inspired by Thurber to include in this collection. Samuel R. Delany’s ‘Prismatica’ (1977) shares the same sing-song, poetic syntax of Thurber’s classic. He echoes Thurber’s trope of repeating phrases, almost like an incantation – “a wizard so great and so old and so terrible that you and I need never worry about him,” for example – and also has a wonderfully Thurberesque ear for onomatopoeia (onvbpmf, glumphvmr, fuffle). E. Lily Yu’s story, ‘The Cartographer Wasps and the Anarchist Bees’ might read like an Orwellian parable of masters and slaves, but the real delight in the story is the imagery. Take this, from the opening section: “In this way it was discovered that the wasp nests of Yiwei, dipped in hot water, unfurled into beautifully accurate maps of provinces near and far, inked in vegetable pigments and labelled in careful Mandarin that could be distinguished beneath a microscope.” Fleeing from the map-plundering humans, the wasps make off in a boat, “provisioned with fallen apricots and squash blossoms” to establish a new colony. The tale unfurls, much like the wasps’ maps, in miniature such that the reader is left gazing up in wonder at the stained glass windows made of bee wings in the wasps’ council chamber. Frank R. Stockton was an American humorist whose children’s stories stood out for their refusal to moralize and sermonize, but who used gentle humour to explore human foibles and flaws. In this collection, ‘The Griffin and the Minor Canon’ (first published in 1885) tells the tale of a lonely Griffin and a gentle clergyman who strike up a strange and tender friendship in the face of the townsfolks’ fear and prejudice. It opens on an entrancingly fairytale-like note: “Over the great door of an old, old church which stood in a quiet town of a far-away land there was carved in stone the figure of a large griffin.” When the real Griffin, a huge and fearsome-looking creature, with talons and wings, a wickedly sharp beak and a long, curling tail, gets to hear about his likeness on the church, he decides to pay a visit – much to the consternation of the townsfolk. Echoing the old ‘Beauty and the Beast’ fairytale, we are left wondering who is more monstrous: the creature or the humans? Gaiman’s own contribution to this collection is told in characteristic swashbuckling style. Here’s how he introduces it: “Lightning bugs, dolphinfish, dung beetle, unicorn flank steak… the intrepid members of the Epicurean Society have eaten every kind of animal. Or have they…?” What follows is a Rabellasian quest by a coven of adventurous eaters: Augustus TwoFeathers McCoy, “big enough for three men, who ate enough for four men and who drank enough for five”; Professor Mandalay “small and twitchy and grey as a ghost (and perhaps he was a ghost; stranger things have happened)”; Virginia Boote, the food critic, who “had once been a great beauty but was now a grand and magnificent ruin”; and Jackie Newhouse a direct descendant of “the great lover, gourmand, violinist and duelist Giacomo Casanova.” With a cast of characters like this, you could hardly fail to enjoy the tasty spread, and Gaiman falls too like a man starved of language and sinks his teeth right in with some deliciously chewy sentences. Reminiscing on their past conquests (including flash-frozen mammoth and Patagonian giant sloth, not to mention panda-steaks), Newhouse at one points sums up their motley crew: “We have become cosmonauts exploring undreamed-of worlds of delectation and gourmanderie.” It’s such a meaty and satisfying tale, you end up feeling pleasantly stuffed and in need of a good old burp. It’s of course impossible to do justice to all the stories in this collection, but the publisher’s description of James Thurber’s The 13 Clocks would do just as well for Gaiman’s Unnatural Creatures: it is a work of ‘dark and delicate whimsy for all ages.’ Buy it – mainly for the reason that this collection of stories weaves together so many delicious elements: the macabre, the fantastical, the lyrical, and occasionally, the downright silly. But buy it also because the proceeds will go to the very fantastic non-profit organization, 826DC which was set up by novelist Dave Eggers to foster students writing skills. With any luck, the book will help the real Museum of Unnatural History, at the 826DC headquarters in Washington DC, to restock the bottles of unicorn farts in their gift shop, and do whatever it is that they so brilliantly do to make life a little weirder, wilder and more wondrous for the kids (and their parents) that pass through.